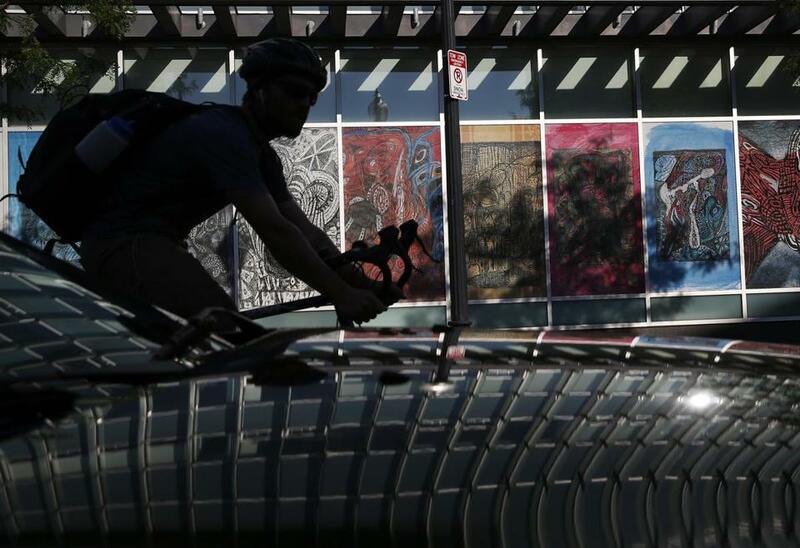 A bicyclist was silhouetted as he passed by a display of artwork in Boston last year. The odds of cyclists being injured in an accident in Boston have decreased significantly in recent years as the city has made a slew of changes to promote bike riding and improve safety, Harvard University researchers have found. The study, published in the December issue of the American Journal of Public Health, concluded there was a 14 percent reduction in the odds of being injured in a cycling accident for each year from 2009 through 2012. The lead author, Felipe Pedroso, said the reduced risk came as Boston made a host of changes, including dramatically expanding bike lane mileage citywide, installing more signs, improving crosswalks, and rolling out the Hubway bike-share program in 2011. The study shows that “improvements in infrastructure result in increases in safety,” Pedroso said. Pedroso said the increased ridership that has come with the safety improvements has made biking even safer. For many, Amanda Phillips’ death served as another reminder of the dangers of biking in Boston. 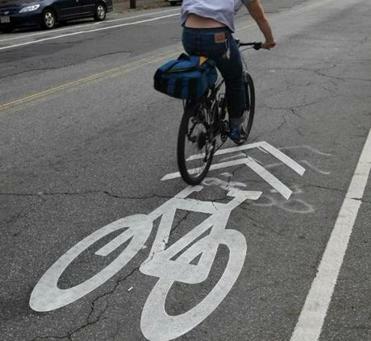 The study relied on a database of about 1,800 cycling accidents that were reported to police between 2009 and 2012. The overall number of cycling accidents in Boston increased during the years the study focused on. There were 358 in 2009, compared with 488 in 2012. But at the same time, bike use became much more popular in Boston. When compared with the increased number of commuters biking to work, there was no statistically significant change in the accident rate, and there was a decrease in the rate of accidents in which cyclists were injured. In an editorial advocating for infrastructure improvements to improve cycling safety, the journal provided statistics showing growth in bike lane networks in a number of cities has led to reduced crash, injury, and fatality rates. The editorial pointed to places like Cambridge, New York, Chicago, Los Angeles, Philadelphia, Seattle, San Francisco, and Washington, D.C.
Boston’s transportation commissioner, Gina Fiandaca, said the study was a testament to the city’s efforts. “Over the last several years, we’ve really taken some concrete measures to improve cycling safety,” she said. She cited improvements, including painting bike lanes, building physically separated tracks for cyclists, and requiring side guards on large city-contracted vehicles to prevent bikers from being caught underneath them. Fiandaca also said the city has offered safety-focused training programs in recent years and expects to soon secure final approval to lower the new default speed limit for Boston from 30 miles per hour to 25. Stefanie Seskin, Boston’s active transportation director, said the city also has redesigned some streets to encourage motorists to drive more slowly. And, she said the city regularly monitors accident data to identify and address spots in the city with above-average crash rates. “Any small change we can make to make our streets safer for everyone — we try to take those steps whenever possible,” Seskin said. To be sure, while injury risks may have decreased, cyclists have suffered serious, deadly injuries in recent years. In fact, as the Globe has reported, a 2014 study found Boston had more cycling fatalities per 10,000 bike commuters than Denver, Minneapolis, Portland, Seattle, and Washington, D.C.
■ The odds of being injured while riding a bike on a main road — which are more likely to have bike lanes — are about 37 percent lower than riding on other roads. ■ The odds of cyclists being injured in auto-related accidents are 76 percent higher than in other types of accidents. ■ The odds of injury in accidents involving car doors are 225 percent higher than other types of accidents. “This is an interesting finding because it shows that if we expanded on strategies that separated bicycles from cars that we may have a significant impact on overall injuries,” Pedroso said. ■ For every one degree Celsius increase in temperature, the odds of being injured in an accident increase by about 2 percent. “This makes sense given that there are more cyclists out during warmer temperatures,” Pedroso said. ■ The odds of injury were about 15 percent lower at intersections. Pedroso said that may be because intersections, by nature, force drivers, cyclists, and pedestrians to be particularly alert. And there have been safety-related infrastructure improvements at intersections in recent years. ■ A cyclist’s age, gender, race, and ethnicity had no statistically significant impact on the odds of injury.